The more one knows about the unique characteristics of wood and its source, the better one can understand the degree of warmth and beauty that it brings to our everyday décor. Furniture made of wood is one of the few things in the world that all people can own and know that they are the only person in the world who owns that particular grain pattern and its inherent beauty. Each grain pattern is a unique masterpiece of design, texture and splendor. Even what some may view as a defect, like a knot or other natural blemishes, can add more beauty and character to any given piece of furniture. The classification of wood has historically always been either hard wood; any leaf bearing tree, and soft wood; any cone bearing tree. These terms can be confusing since some leaf bearing trees can have very soft wood and some coniferous trees can have very hard woods. To make this easier, below you will find a list of different tree types, classification and then individual wood characteristics. There are two basic wood grades. Select lumber is excellent quality for use when appearance and finishing are important and common lumber that has defects used for construction and general-purpose projects. The grades of the select lumber are: B and Better grade, which has minute or no blemishes; C Select grade which has some minor defects such as small knots; D select grade that has larger imperfections, which can be concealed by paint. The grades of common lumber are No. 1 grade containing tight knots and few blemishes. No. 2 grade that has more and larger knots and blemishes. No. 3 grade that has loose knots, knotholes, and other flaws. No. 4 grade that is low quality and No. 5 grade where the appearance is not important. OAK: Oak is the most widely used hardwood. There are more than 60 species of oak grown in the U.S., which can be separated into two basic varieties; white and red. The red variety is also known as black oak (a reference to its bark). Properties: Oak is a heavy, strong, light colored hardwood. It is ring porous, due to the fact that more and larger conductive vessels are laid down early in the summer, rather than later. Prominent rings and large pores give oak a course texture and prominent grain. Oak also has conspicuous medullary rays which can be seen as "flakes" in quarter sawed oak lumber. Uses: Oak is the most popular wood used to craft American and English country designs. It is also used for Gothic and William & Mary reproductions, as well as many transitional and contemporary pieces. MAPLE: There are 115 species of maple. Only 5 commercially important species grow in the U.S. Two of the five are hard rock maple and sugar maple. Properties: Maple is so hard and resistant to shocks that it is often used for bowling alley floors. Its diffuse evenly sized pores give the wood a fine texture and even grain. Maple that has a curly grain is often used for violin backs (the pattern formed is known as fiddleback figure). Burls, leaf figure, and birds-eye figures found in maple are used extensively for veneers. The Birds eye figure in maple is said to be the result of stunted growth and is quite rare. Uses: Maple is used extensively for American colonial furniture, especially in medium and lower priced categories. It can also be stained to simulate cherry wood, which it resembles. MAHOGANY: Mahogany, also known as Honduras mahogany is a tropical hardwood indigenous to South America, Central America and Africa. There are many different grades and species sold under this name, which vary widely in quality and price. Mahogany which comes from the Caribbean is thought to be the hardest, strongest and best quality. Logs from Africa, though highly figured, are of slightly lesser quality. Philippine mahogany has a similar color, but is not really mahogany at all. It is a much less valuable wood, being less strong, not as durable or as beautiful when finished. Properties: Mahogany is strong, with a uniform pore structure and poorly defined annual rings. It has a reddish - brown color and may display stripe, ribbon, broken stripe, rope, ripple, mottle, fiddleback or blister figures. Crotch mahogany figures are widely used and greatly valued. Mahogany is an excellent carving wood and finishes well. Uses: Mahogany is used extensively in the crafting of Georgian, Empire and Federal reproduction furniture. Mahogany is also used in styles ranging from Victorian furniture reproductions to Contemporary. CHERRY: Cherry is grown in the Eastern half of the U.S.. It is sometimes called fruitwood. The term fruitwood is also used to describe a light brown finish on other woods. Properties: A moderately hard, strong, closed grain, light to red-brown wood, cherry resists warping and checking. It is easy to carve and polish. Uses: Cherry veneers and solids are used in a variety of styles. Cherry has been called New England mahogany and is often used to craft 18th century, Colonial and French Provincial designs. WALNUT: Walnut is one of the most versatile and popular cabinet making woods. It grows in Europe, America and Asia. There are many different varieties. Properties: Walnut is strong, hard and durable, without being excessively heavy. It has excellent woodworking qualities, and takes finishes well. The wood is light to dark chocolate brown in color with a straight grain in the trunk. Wavy grain is present toward the roots, and walnut stumps are often dug out and used as a source of highly figured veneer. Large burls are common. Walnut solids and veneers show a wide range of figures, including strips, burls, mottles, crotches, curls and butts. European walnut is lighter in color and slightly finer in texture than American black walnut, but otherwise comparable. Uses: Walnut is used in all types of fine cabinet work, especially 1 8th century reproductions. 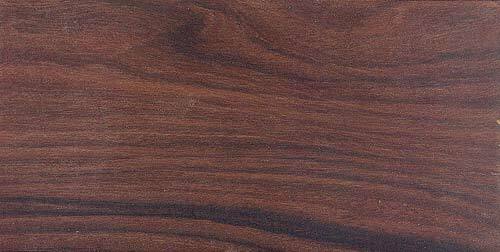 ROSEWOOD: Very hard and has a dark reddish brown color. It is fragrant and close grained. It is hard to work and takes high polish. Used in musical instruments, piano cases, tool handles, art projects, veneers and furniture. TEAK: True teak is indigenous to Southeast Asia, but similar wood species also grow in Africa. Properties & Uses: Teak is a yellow to dark brown hardwood which is extremely heavy, strong and durable. Often strongly figured, teak may show straight grain, mottled or fiddleback figures. It carves well, but because of its high value, is often used as a veneer. Scandinavian modern, and oriental furniture styles are often crafted of teak. 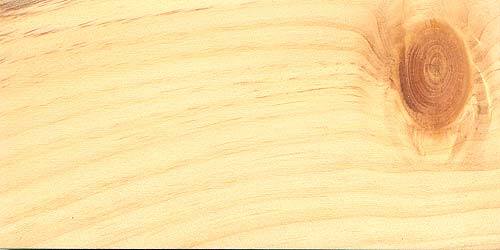 Properties: Pine is a soft, white or pale yellow wood which is light weight, straight grained and lacks figure. It resists shrinking and swelling. Knotty pine is often used for decorative effect. Properties: Ash is a hard, heavy, ring porous hardwood. It has a prominent grain that resembles oak, and a white to light brown color. Ash can be differentiated from hickory (pecan) which it also resembles, by white dots in the darker summerwood which can be seen with the naked eye. Ash burls have a twisted, interwoven figure.